I have seen a hundred darling, small powder rooms, with bold wallpaper and cute accents. 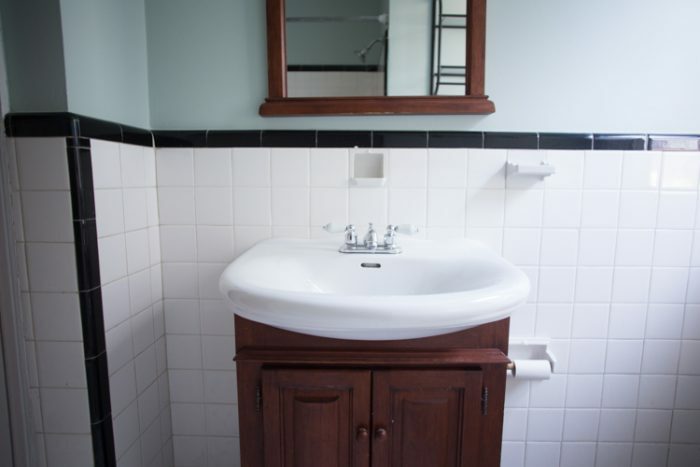 In our fixer upper, I didn’t have a powder room, but a small, full bathroom with a shower in the hallway that needed some love. 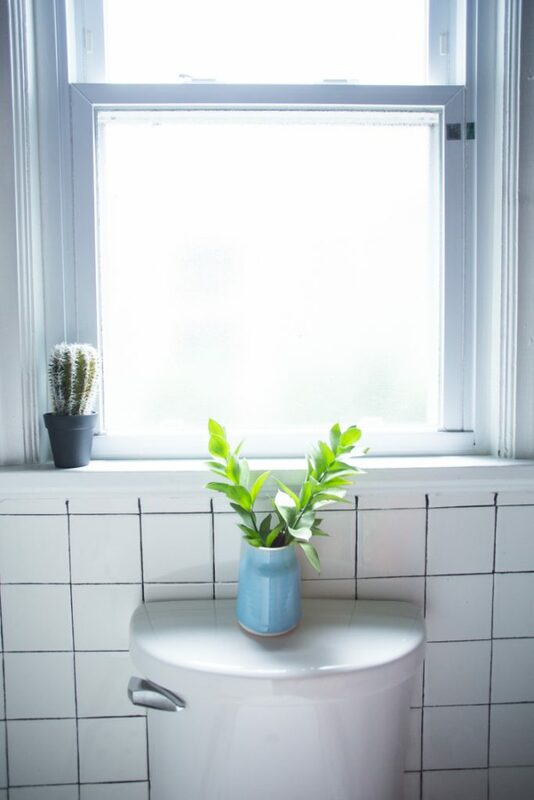 I realized that finding inspiration for small bathroom ideas with a shower is a little tougher, and want to share my top tips for maximizing the space and style in your small bathroom. I worked on this hallway bathroom as part of my August Room by Room Challenge. 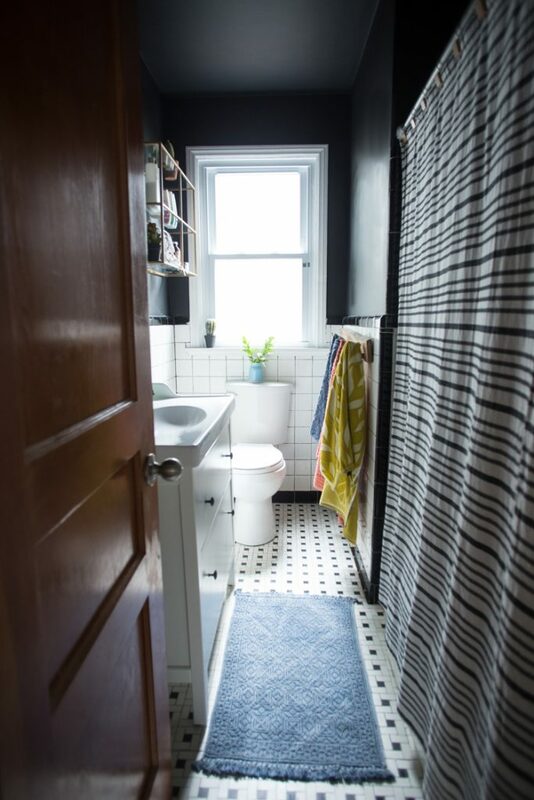 When we bought the house back in January, I had immediately fallen for the original black and white tile, and the bright window. Beyond that, it felt small, inefficient, and outdated. 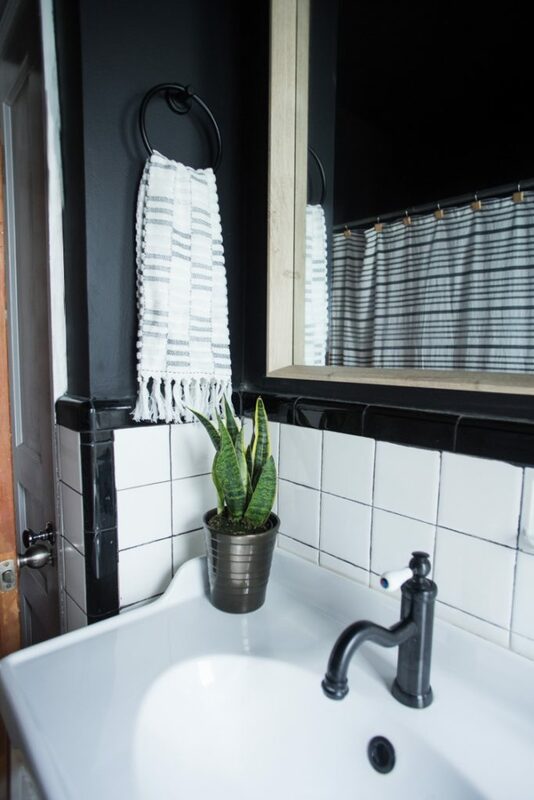 I was able to create a quick list of improvements that made: Paint, Plumbing, Electrical, Vanity Storage, Shelving, Towel Hooks, Lighting, Privacy Window Film, and Grout Stain. 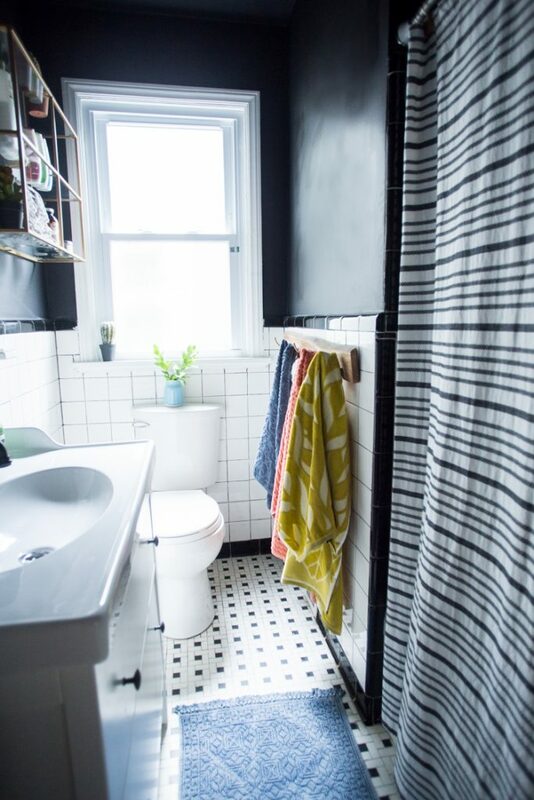 Here some tips for small bathroom designs with a shower, that will walk you though my process as I turned this room into a space I love! So, what are the elements that made all the difference? Let me tell you! There is a common misconception that lighter paint always is better for small spaces. This is totally not true, and in some cases, darker paint can actually create a larger feel in a room because of the way it recedes. This can be especially true when the paint is carried up onto the ceiling. 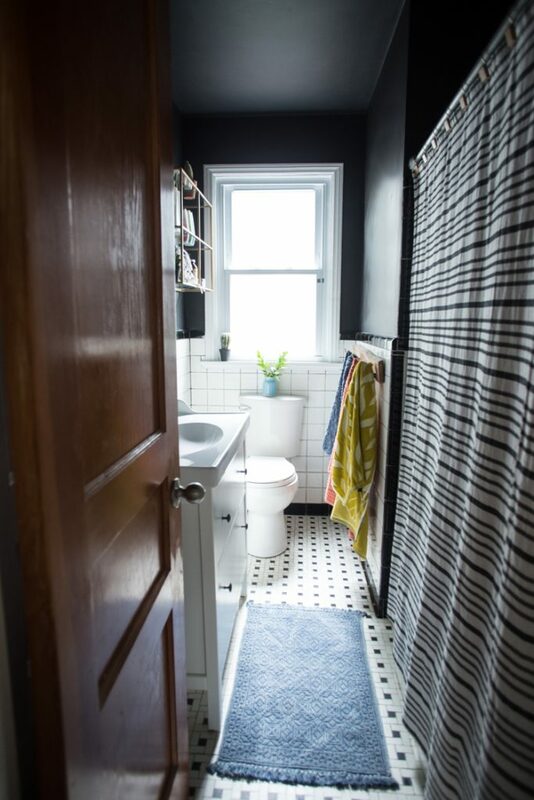 Rather than go with a color, or a bright white, I decided to play on the black and white tile in this small bathroom and paint the upper walls black. I used Sherwin-Williams Black Magic in Matte sheen. The dark paint eliminated the top black tile trim, and emphasized the bright whiteness of the bottom half of the room. It added drama and intention, and although the room isn’t actually any bigger, it FEELS more intentional. One important factor in any bathroom, but especially a small bathroom design with a shower is that the plumbing and fixtures work really well. Don’t spend a lot of time and money making the room LOOK nice without making it also FUNCTION well. In this bathroom, somehow the hot water had become disconnected from the pipes, so I had a plumber come in and rework it all, as well as update the shower and tub fixtures. It is nice to actually be able to use the shower and tub now! I also updated the fixture on the sink when I replaced the vanity. 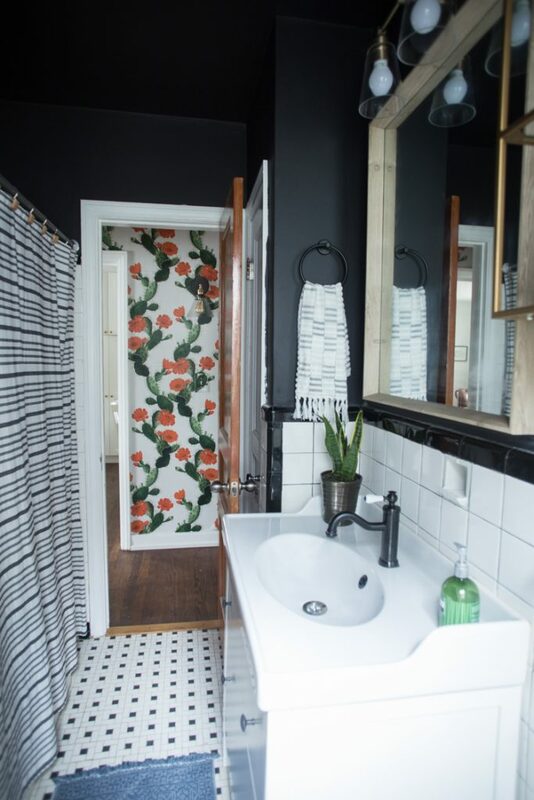 The sleek, black design ties in well with the paint and tile, and feels elevated. 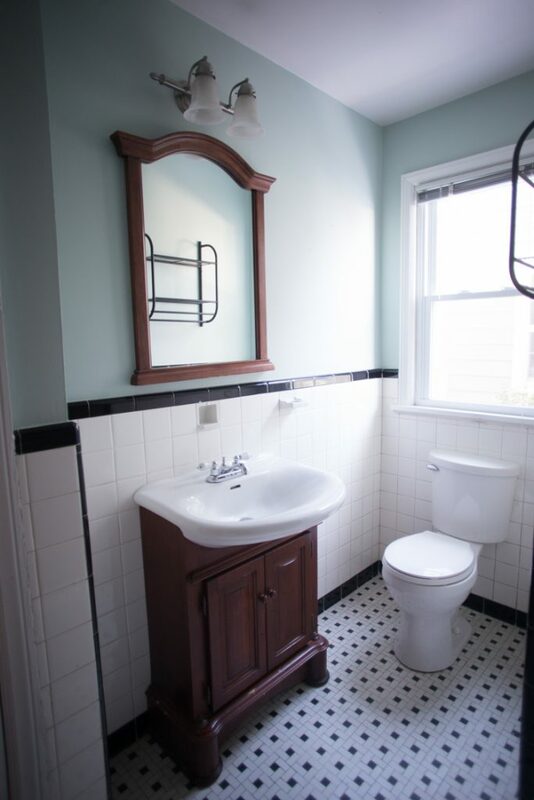 When thinking about a small bathroom design, you really need to consider function. This 1948 house was wired for a light fixture above the mirror, but it did not have an electrical outlet for a blowdryer or electric toothbrush. 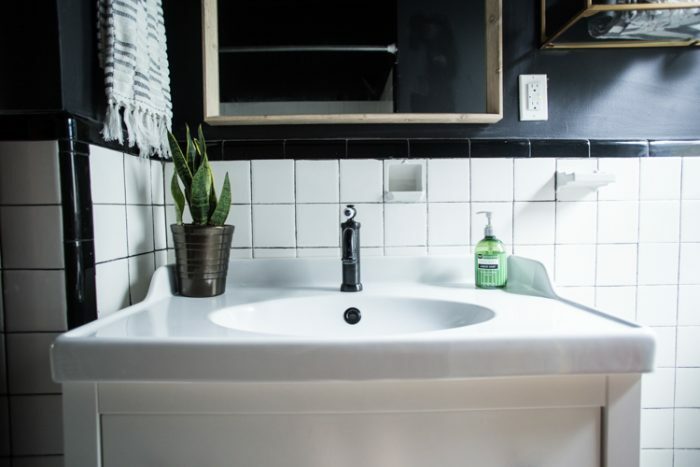 Because this bathroom doubles as our guest bathroom, I hired an electrician to install a GFI outlet above the sink so that there is the option available for people staying with us. 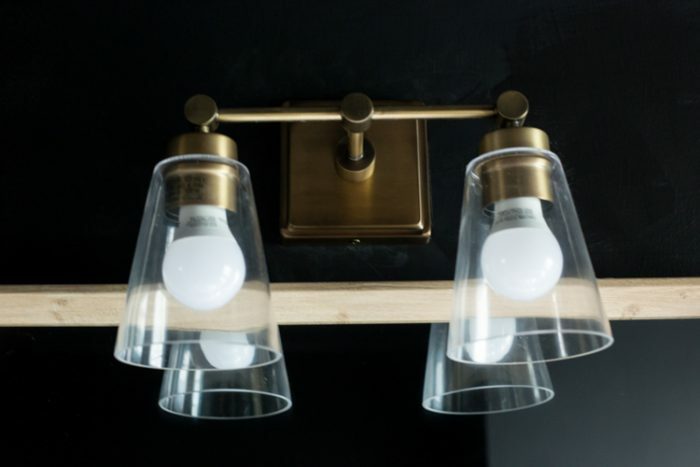 He also centered the new light fixture above the updated vanity. 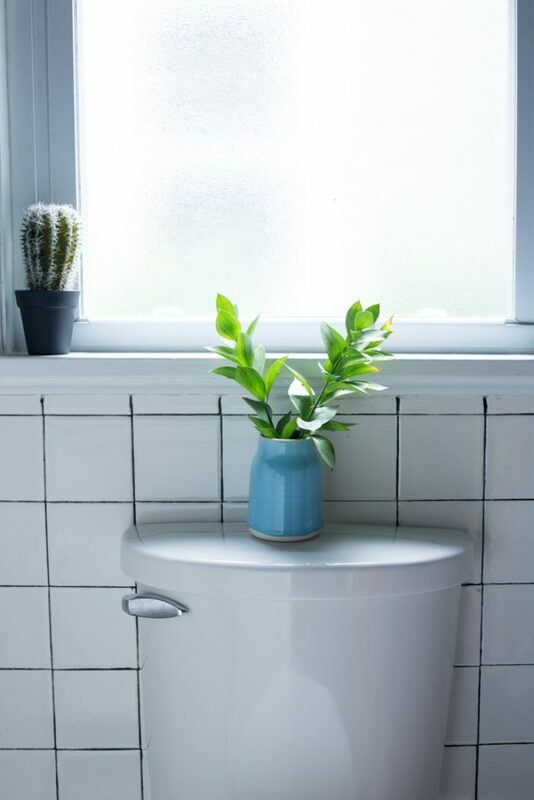 In your small bathroom, storage is key. This bathroom has a small linen closet, but it is filled with sheets and towels. When I replaced the vanity, I made sure to find a piece of furniture with drawers. 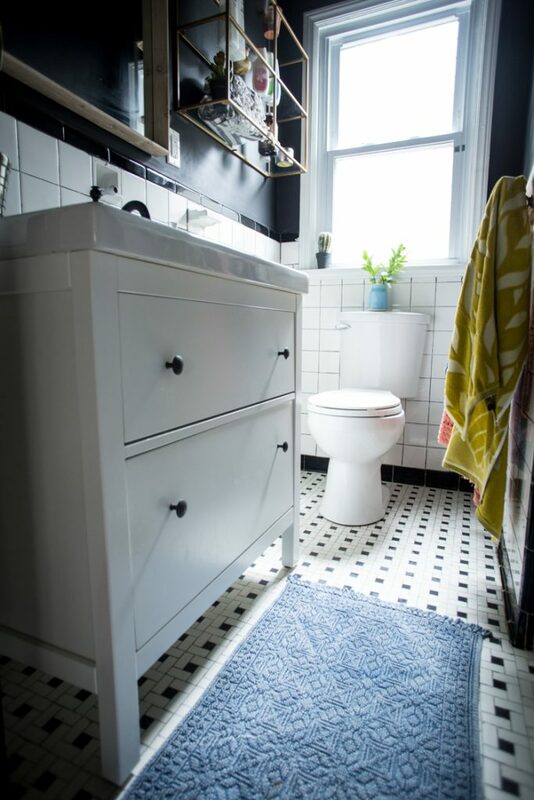 I love these IKEA vanity systems that have functional top and bottom drawers, because of the way the indulged pipes move the plumbing away beneath the sink! I installed the vanity and re-routed the plumbing all myself and am so happy with how it allowed for more storage in the vanity. We are able to keep toothbrushes and toothpaste, vitamins, hand towels, extra toilet paper and toiletries, and cleaning supplies all hidden in these deep, functional drawers. 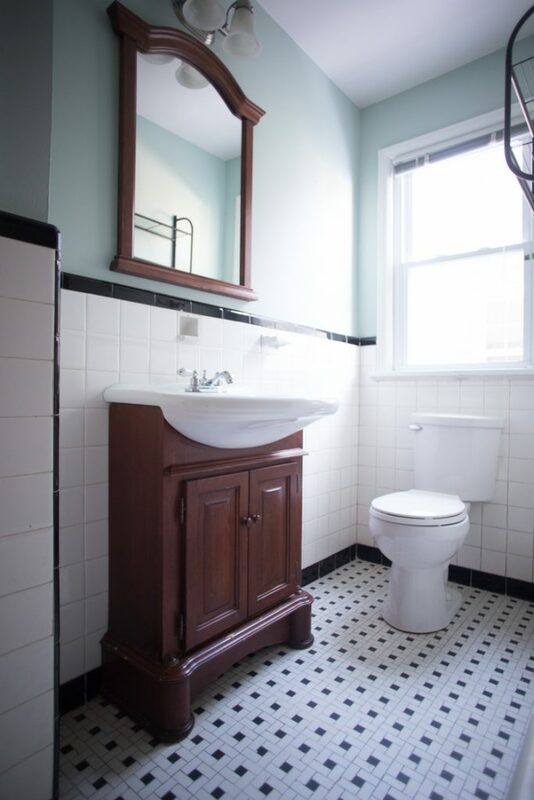 One of my favorite design ideas for small spaces, especially small bathrooms, is styled open shelving. When you add a sparsely decorated open shelving unit to a small bathroom, it gives the illusion that there is room to spare! 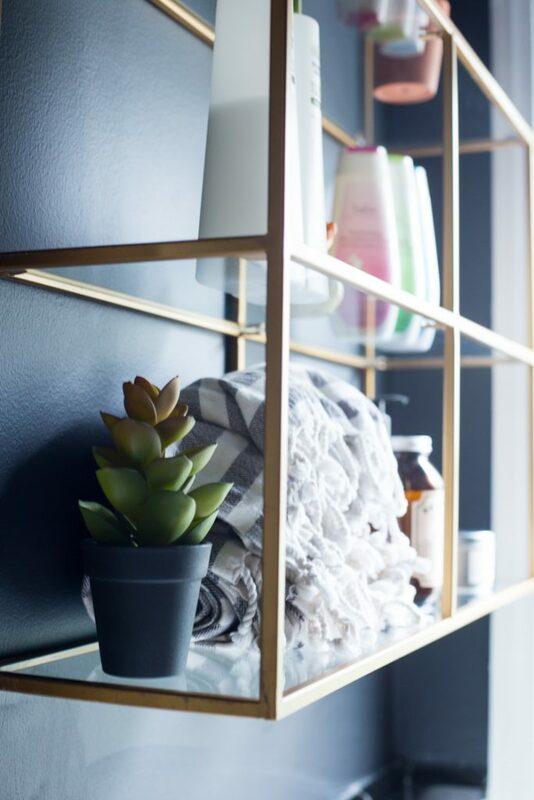 I love this particular brass and glass shelf, because it doesn’t take up any visual weight, and it is so pretty. I use it to hold decorative but still useful items like pretty shampoos, bath salts, and extra towels. And plants, of course. 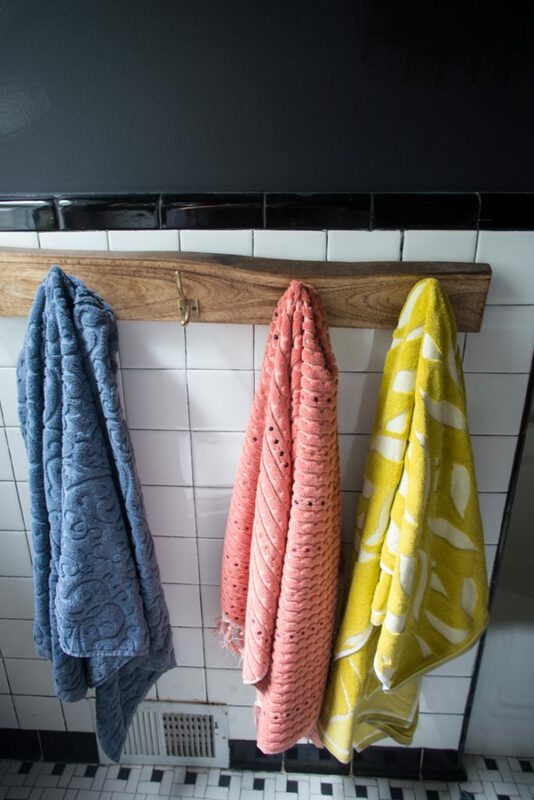 In a kids/guest bathroom combo, like we have, there is room for extra towels when needed, and the hooks are low enough that the kids can grab their towel themselves. I love to create as much autonomy in the design for a kids’ space as possible. 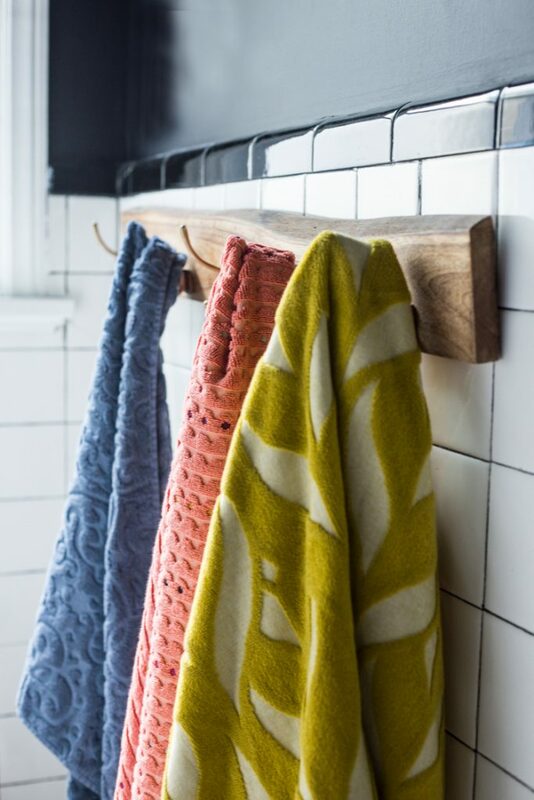 This pretty live edge wood and brass towel hook is one of my favorites, and it attached right to the same holes in the tile where the previous bar had hung, conveniently eliminating my need to make more holes. In any space, the light figures feel like the finishing touches, or the jewelry of the room. This is even more true in a small bathroom where there are not many other things to look at. 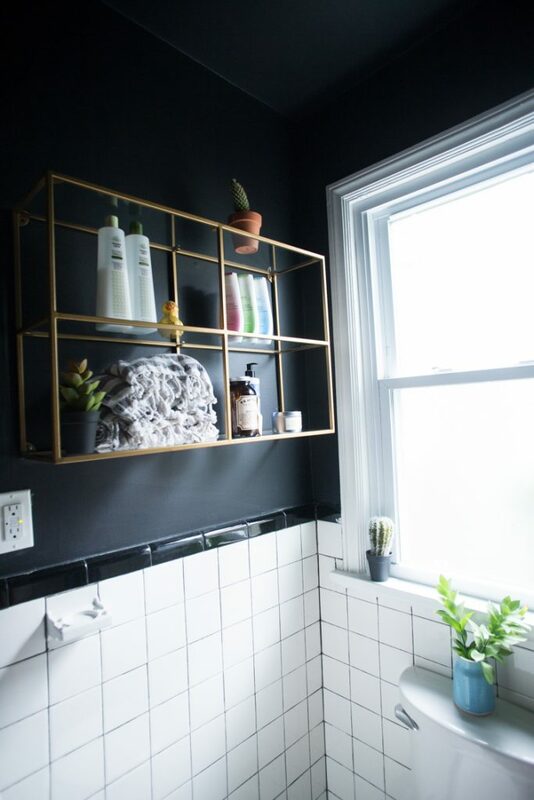 I love to mix metals, and choose a brass light in this small bathroom, which plays nicely with the matte black plumbing fixtures and the brass shelving and hooks. The glass shades disappear, and the light is a pretty finishing detail without being imposing. While I love natural light in the bathroom, I don’t love the idea of covering it all up with curtains or blinds. My favorite solution to keeping both the light and the privacy is adding a simple privacy window film. I found this really simple rainwater glass style for under $10, and was able to add it to the window in about 5 minutes. The sunlight can come right through, and the window feels bigger and brighter without the blinds blocking the frame and light! I fell in love with grout stain in our Texas home when I stained the tile grout in the shower of our guest bathroom. It is inexpensive, easy to apply, and instantly refreshes the room. In a small bathroom design with a shower, the tile makes a difference. Adding a fresh grout stain can emphasize the pretty tile shape, or simply re-whiten and refresh the current grout color. 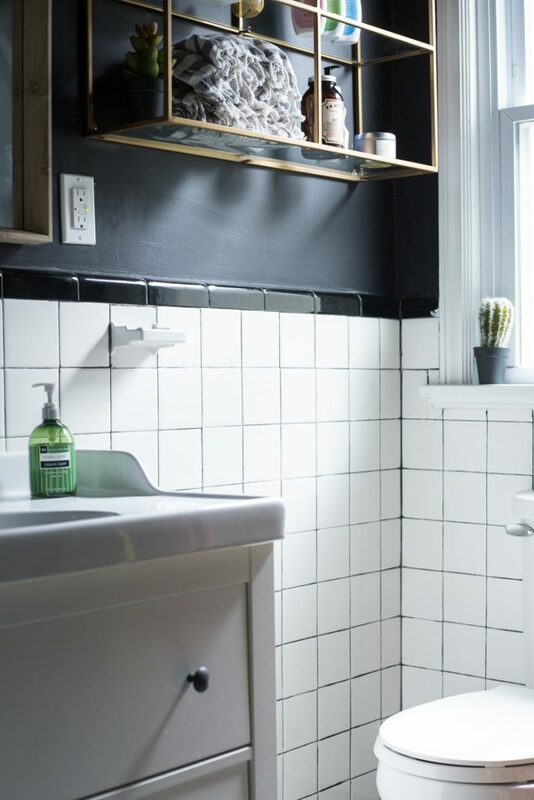 I prefer to darken the grout color by applying a dark grey grout stain, but this would also work well for brightening or lightening dingy grout. This is the type I use, and here is my original post about how to stain tile grout. 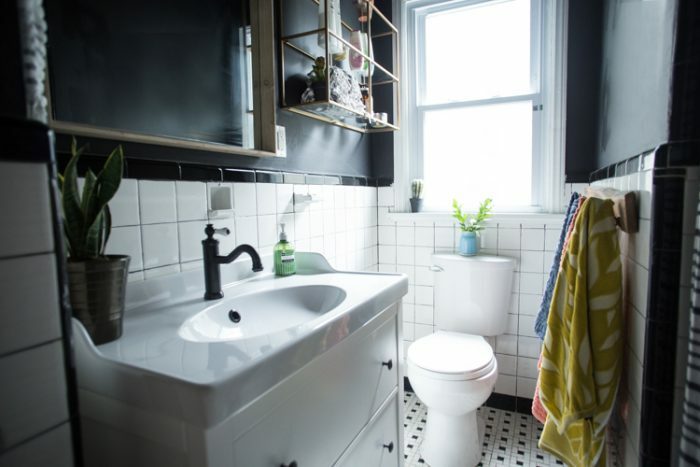 Once I made it thought my punch-list, my small bathroom design with a shower and new sink and fresh paint and grout looked so good. 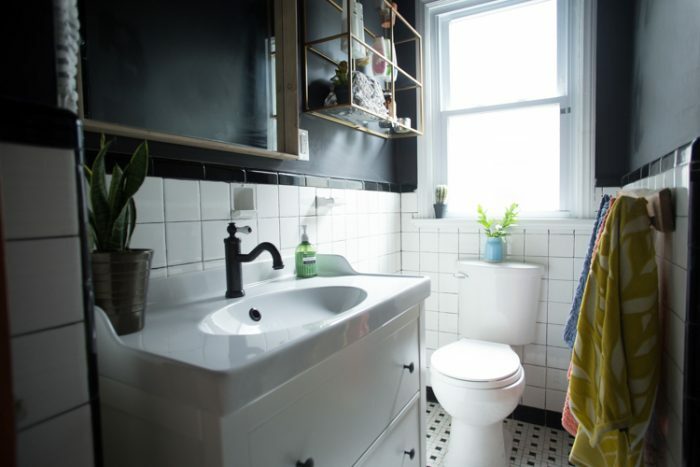 While I couldn’t easily add square footage to this small bathroom, I could make the current space feel intentional, beautiful, and fresh. I love the way it turned out and am excited to continue on to my next room in the Room by Room Challenge: Milo’s Bedroom/Guest Room.